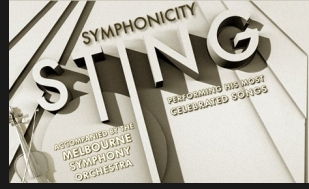 Almost 12,000 people enjoyed a magical moment under the stars at a winery just outside of Perth on Saturday night as Sting, performing with the Melbourne Symphony Orchestra, kicked off his Australian Symphonicity tour. The balmy night threatened to rain down on the people sitting on the hill at Sandalford Winery. But the weather held off until the first bars of the song 'Fragile' towards the end of the evening, poignantly accompanying the lyrics: "If blood will flow when flesh and steel are one/Drying in the colour of the evening sun/Tomorrow's rain will wash the stains away". The singer, known for his work with '80s star band The Police and romantic solo megahits, held the crowd captivated from the moment the lithe yoga fan walked onto the stage wearing tight black pants, shirt open to show off a bit of chest, launching into a string of hits Sting describes as "re-imagined" to work with the orchestra. Feeling no doubt refreshed after a Perth Bikram yoga class that morning, after a long flight from Tokyo during which he was woken from much-needed slumber by fans hungry for autographs, there was no doubt that the 59-year-old superfit singer still had it. His voice never wavered, and was perfectly complemented by Adelaide backing singer Jo Lawry and the crazy antics of maestro Steven Mercurio from London's Royal Philharmonic Orchestra. The maestro, a theatrical performer who at times was so excited he was airborne, brought the symphony to life, with violin and clarinet solos providing some of the best moments of the show. As a crowd of VIPs including Fremantle Dockers captain Matthew Pavlich, and teammate Luke McPharlin and their wives, Seven newsreader Rick Ardon and plenty more watched on, tunes including 'Roxanne', 'Englishman in New York', 'Fields of Gold' and 'When We Dance' were performed with attitude and sophistication. The orchestra showed off their power best when they performed 'Russians', the musicians working together to create a booming, dramatic take on the tune. Towards the end of the performance the crowd bounced to their feet, with Sting returning for encores that ended with a rousing rendition of The Police hit 'Message in a Bottle'. Sting continues his Australian tour with concerts near every major city, including Brisbane. The singer, one of many artists who donated a song to a Flood Relief CD, has also made a personal donation and will ask audiences to contribute via collection tins at each event.